Microsoft released a batch of updates for company products today as part of the company's monthly Patch Tuesday event. The December 2016 overview of Microsoft's Bulletins provides you with detailed information on all bulletins and related information. This includes, among other things, a list of all security bulletins and their severity rating, information about affected operating systems and other Microsoft products, update download information, and a list of non-security updates released by Microsoft since the November 2016 update. Microsoft released a total of 12 bulletins on the December 2016 Patch Day. 6 of those 12 bulletins received the highest severity rating of critical, the remaining 6 bulletins a rating of important, the second highest rating. All Windows client and server operating systems that are supported by Microsoft are affected by at least one critical vulnerability. As far as bulletins are concerned, the critically rated bulletin Ms16-145 is only released for Windows 10 as it is a cumulative security update for Microsoft Edge. Windows 10 shares the second "excess" bulletin that is rated critically with Windows RT 8.1 and Windows 8.1. This is MS16-154 that delivers security updates for Adobe Flash Player which is only part of Windows 8.1 and newer versions of Windows. Last but not least, the two important vulnerabilities that affect only Windows 10 are MS16-150 and MS16-152. The first is a security update for secure kernel mode, the second a security update for Windows kernel. This security update resolves a vulnerability in Windows Uniscribe. The vulnerability could allow remote code execution if a user visits a specially crafted website or opens a specially crafted document. Users whose accounts are configured to have fewer user rights on the system could be less impacted than users who operate with administrative user rights. This security update resolves vulnerabilities in Microsoft Windows. The more severe of the vulnerabilities could allow elevation of privilege if a locally authenticated attacker runs a specially crafted application. This security update resolves a vulnerability in Microsoft Windows. The vulnerability could allow information disclosure when the Windows kernel improperly handles objects in memory. This security update resolves a vulnerability in Microsoft .NET 4.6.2 Framework’s Data Provider for SQL Server. A security vulnerability exists in Microsoft .NET Framework 4.6.2 that could allow an attacker to access information that is defended by the Always Encrypted feature. We publish the remaining updates once Microsoft provides information on them. Includes all security updates described in Kb3205400, and all updates of KB3197875 for Windows 8.1 and Windows Server 2012 R2. 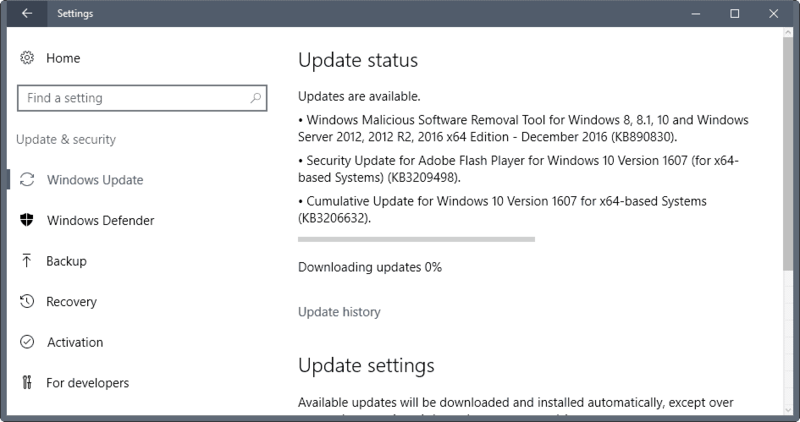 Includes all security updates listed in KB3205394, and all updates released as KB3197869. Updates for Windows Vista are released as individual patches, while updates for Windows 7, Windows 8.1 and Windows 10 as rollup or cumulative releases. The main difference is that updates are one big file on those newer systems so that you cannot select what to install anymore. Windows Update is the primary updating mechanism for consumer devices. The built-in service is configured to check for, download, and install updates automatically by default. You may run a manual check for updates with a tap on the Windows-key, typing Windows Update, selecting the result, and clicking on the "check for updates" link on the page that opens. Updates are also made available on Microsoft's Download Center and through the Microsoft Update Catalog. Microsoft stopped releasing monthly security releases in August 2016 apparently. Thanks for the links to the Security Only updates! You gave us a great overview here. Thank you Mr Brinkmann! Helps a lot! I run Windows 7 and Office 2007. There were six Office 2007 security updates. Since I use LibreOffice and Thunderbird instead of Office, I am in no rush to install these updates without more information about them. Yes thank you very much. You provide a service that’s worth a lot to your followers. Best regards. is there a “security only” update for the .Net Framework? On Windows 7, Windows Update shows a “December, 2016 Security and Quality Rollup for .Net Framework 3.5.2, 4.5.2, etc…” item. Thank you, Martin. Without knowing the KB number, is there a way to find it? No matter what I typed in the top right search box, I never saw this one. You could search for “security only update for .NET” and sort by last updated. Yes I noticed that as well. I have a similar question to the one chris posed. It concerns KB3205404 which isn’t listed here anywhere. The description for it in WU is: “December, 2016 Security and Quality Rollup for .NET Framework 3.5, 4.5.2, 4.6, 4.6.1, 4.6.2 on Windows 8.1 and Windows Server 2012 R2 for x64 (KB3205404)”. But I was a bit concerned about the description “Quality Rollup” in the title since it might include the telemetry bits we’re all trying to avoid. I’ve hidden it for the time being, but do you have any info on that aspect? You can follow the trail to find out. I cannot vouch that the information is complete though. As can be seen from the last paragraph, there’s only one .NET update per month which is the one containing the quality bits I was concerned about. But many thanks for providing the additional info links. Thank you very much for helping us to understand the foggy mess that became windows update. After this week’s update, my Toshiba laptop running Windows 8.1 no longer enables the battery to charge; it has now run down to zero. Whether the power cord was in or out, power continued to drain. Not even a System Restore corrected the problem. Always prepared, I have a replacement battery and power cord – however these made no difference: my laptop still failed to allow the battery to recharge. Is there anything I can do about this, or should I accept that MS have effectively forced me to consign my expensive laptop to the dustbin, given that plugging in the power cord has nil effect, i.e. the laptop is effectively dead? You might have a defective AC adapter. Toshiba has some troubleshooting tools on their site which can help identify what the problem is. Thanks for taking time to respond, Xircal. I’ll check the link you’ve suggested and hope it works. My Lenovo also with 8.1, had the exact same thing happen, after this update… stuck at 12%, plugged in not charging error. After going through event viewer, saw that this update was just prior to this problem. I can’t seem to get this update, or any security rollup update to work ever since they empoyed this system. I have a Toshiba Satellite 2013, running Windows 8.1 64-bit. Any other updates work fine, but the security rollups do not. They download, go through the installing process, then uninstall themselves (undo changes) or stop themselves and give me an error. Since I have the same laptop as the person above, I do not want it ruining my ability to charge my battery. I need this computer for work. I checked Regedit and I have framework 4.5.51650. Do I need this update? At this point Microsoft has prevented me from getting important security updates, what do I do? I don’t feel safe updating anymore. I feel if my computer refuses to update them maybe there is a good reason. And no, troubleshooting and FixIt does not help. I have the same issue with October, November and December Quality updates. It seems like this issue is very common and Microsoft is not doing anything to fix this issue. I’m only having this issue on 2012 R2. Every other OS is working fine.